IDF cracks down on Arabs hunting animals with weapons near Jewish towns in Judea and Samaria. During the month of Ramadan, when the price of meat rises in the Palestinian Authority, many Arabs in Judea and Samaria hunt for themselves. The increase in the frequency of hunting required IDF forces to be vigilant and to act to maintain security in the area, because Arabs who hunt for food often open fire near Jewish communities. 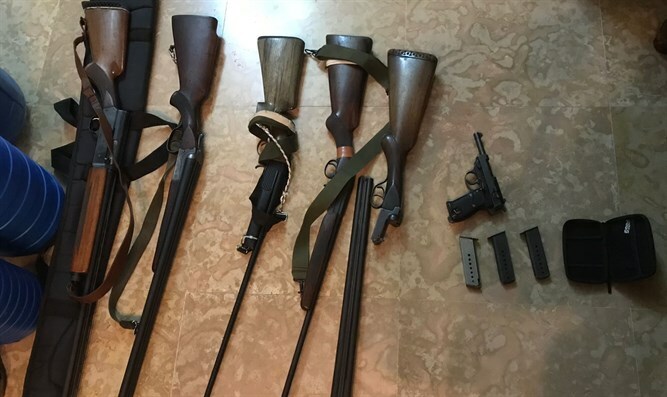 Just last month, five hunting rifles, a pistol and a large quantity of ammunition were seized during a weapons search by the Binyamin Regional Brigade. All the weapons were transferred to the security forces. A few days later, following a shooting near Havat Gilad, a Jew spotted an Arab with a shotgun in an open area and called the security forces. IDF forces from the Samaria regional brigade arrived and pursued the armed man until he was found in a nearby village. Last weekend, gunfire was heard in the area of Itamar and Gedionim. A representative of the Israel Nature and National Parks Protection Authority noticed that there was a hunter in the area and called the IDF forces to catch the suspect. "Any armed person with a weapon without a permit located near the settlement is liable to be a threat and therefore the events of the hunt are taken seriously and accordingly the results are four consecutive incidents in which hunters were caught and arrested by the security forces. We will not allow hunting to pose a danger to the residents of the area," said Major Shlomi Cohen, head of the Samaria Regional Brigade. "The security forces are engaged day and night in initiated offensive operations of weapons and road inspections as part of the campaign against illegal weapons in Judea and Samaria," said Brigadier General Omri Yozher. "We also understand that it is forbidden to carry out illegal hunting that can harm the animals living here in the sector. There is a danger that weapons that are supposed to be used for hunting will be used for terror and we are making great efforts to prevent this phenomenon. Only in the Binyamin Brigade, 53 weapons were seized since the beginning of the year."